Rudy Giuliani tried to find peace with a restless bloc of the Republican Party Saturday, telling religious conservatives not to fear him for his stand on issues such as abortion or expect he would change purely for political advantage. The GOP presidential candidate sought common ground with his audience by casting himself as an imperfect man who has asked for guidance through prayer. He offered assurances that despite his support for abortion rights, he would seek to lower the number of abortions. He pledged that if elected, he would appoint conservative judges, support school choice and insist on victory in Iraq - all issues important to the audience at the Values Voter Summit. A straw poll released at the event Saturday placed Giuliani in eighth place, second to last. The top vote-getter was former Massachusetts Gov. Mitt Romney. In a 40-minute speech received with polite applause, the former New York mayor invoked, as he often does, Ronald Reagan's admonition that "my 80 percent friend is not my 20 percent enemy." "My belief in God and reliance on his guidance is at the core of who I am, I can assure you of that," Giuliani said. "But isn't it better for me to tell you what I believe rather than change my positions to fit the prevailing wind?" It was among his better received lines. But his reception was in stark contrast to the ovations for former Arkansas Gov. Mike Huckabee, a one-time Baptist preacher who is a sentimental favorite of many religious conservatives. Huckabee mixed humor, biblical references and the rhythms of a man used to the pulpit as he implored the crowd to put values above politics and not make expedient decisions. He called for a constitutional amendment declaring marriage to be between a man and a woman and decried the "holocaust of liberalized abortion." "We do not have the right to move the standards of God to meet cultural norms. We need to move the cultural norms to meet God's standards," he said, bringing the crowd to its feet. Their GOP rivals, in speeches Friday, courted the conservative religious voters, who have a tradition of influence in elections. In a straw poll of "values voters" conducted online and at the conference by the sponsoring Family Research Council, former Massachusetts Gov. Mitt Romney came in first with 1,595 votes, followed closely by Huckabee with 1,565. Rep. Ron Paul of Texas was third with 865 and former Sen. Fred Thompson had 564. Giuliani was eighth, one place ahead of lowest vote-getter, Arizona Sen. John McCain. People who paid to join the council were eligible to vote in the online poll, which began in August. For Giuliani, his speech was an important milestone in his search for the Republican presidential nomination. 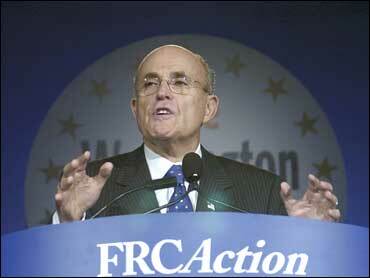 Giuliani supports abortion rights and has moderate views on immigration and gay rights. Married three times and distanced from his son and daughter, Giuliani made a rare reference to his personal troubles. "You and I know that I'm not a perfect person," he said. "I've made mistakes in my life, but I've always done the best that I could to learn form them." His front-runner status in the crowded GOP 2008 field has dismayed some social conservative leaders. Some even have contemplated mounting a third-party candidacy if Giuliani is the Republican nominee. "People of good conscience reach different conclusions about whether abortions should be legal in certain circumstances," he said while vowing to increase adoptions. "We may not always agree," he said. "I don't always agree with myself. But I will give you reason to trust me." Giuliani did not mention the subject of gay marriage in his remarks. Gary Bauer, a Christian activist and former presidential candidate, said Giuliani should have addressed the issue. But, he added, Giuliani helped himself by offering assurances on other fronts. Bauer has been among a group of religious conservative leaders who have contemplated a third-party candidacy if Giuliani emerges as the nominee. On Saturday, Bauer said such a move would be the equivalent of "political suicide." Still, some conservatives planned to meet later Saturday to continue their discussion. Some at the conference said Giuliani had helped himself by giving reason for social conservatives to vote for him in a general election even though they might not support him in the primaries. "He comforted a lot of conservatives," said Bob Kilbanks, an anti-abortion Republican and former congressional candidate in Pennsylvania. "It would be against my conscience to vote for him, but I think he would get a lot of conservative votes and he would come as near to protect life without changing his views and values." While acknowledging differences with his audience, Giuliani cited his faith, noting he attended Catholic schools and even contemplated entering the seminary. He expressed support for social conservative touchstones such as school choice and made clear his opposition to the removal of religious icons and phrases from public places or public discourse.